Oh how I do love po’ boys. Guaranteed great bread, with a crunchy crust and soft insides. Fresh toppings that always pack a little kick. And a bag of Zapp’s chips. The perfect meal. This crab cake po’ boy more than hit the spot. Tender, flaky crab cakes on a homemade po’ boy roll, topped with a killer spicy lettuce mix. The lettuce mixture on this crab cake po’ boy has become my standard po’ boy dressing. It has just the right amount of kick for me, and a little crunch. I pick up a head of iceberg lettuce, shred and chop it, and stuff it into a baggie in the fridge, always on hand when I need to make a po’ boy, which is quite often. I made the bread myself, using a dough recipe that uses a bread machine. The bread is perfect in flavor and texture. But I admit, my dough rolling technique needs work. Sometimes I get perfect loaves, sometimes I don’t. I could substitute French bread, but honestly it’s not quite the same texture. Close, but not quite. Love crab cakes as much as I do? Try my Creole crab cake sliders too! Cut the French bread in half horizontally. Add the sliced tomato, cooked crab cakes and the lettuce mixture. Place all ingredients in a medium bowl and fold to combine. 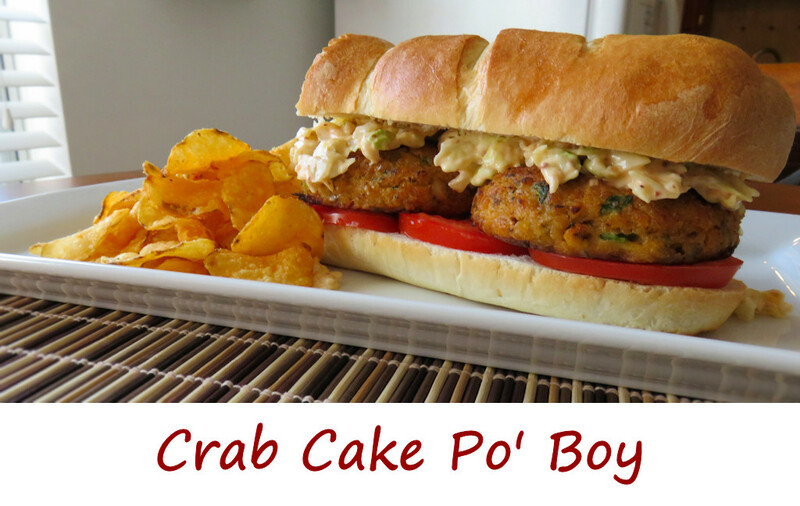 This entry was posted in Main Dishes and tagged crab cake, Crab Cake Po' Boy, po boy, recipe, sandwich by Mike. Bookmark the permalink.